Stop those nosey ears from hearing you! This app will protect you from surveillance, spyware, malware, viruses and backdoor apps. 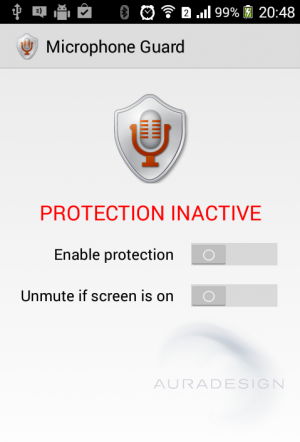 Microphone Guard mutes the internal microphone and make sure that it stays muted. Why you should want this? For your privacy! Lot of apps is now trying to record you or background sounds without notice. Microphone Guard will protect you from eavesdropping by those privacy thiefs. If you value your privacy then download this app, activate the protection and its done. 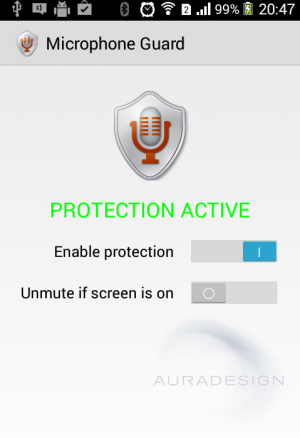 Microphone Guard will silently work in background and it will keep your microphone muted. This does not interfere with phone calls. They will be detected and the microphone will be enabled. You can also choose if you want the microphone muted when you actively use the phone.